Parkinson appeared at the SLO County Board of Supervisors’ meeting as part of a public forum now required by state law on ICE’s access to local individuals. Parkinson has previously stated he opposes sanctuary state rules that bar his agency from cooperating with federal immigration officials, but the sheriff’s office has almost completely cut its ties with ICE since Senate Bill 54 was signed into law in Oct. 2017. SB 54, which took effect on Jan. 1, prohibits state and local law enforcement from cooperating with federal immigration authorities and from inquiring about an individual’s immigration status, except in certain cases, like incidents involving violent felonies. The law is being challenged in court, but the SLO County Sheriff’s Office says it is abiding by it. Parkinson’s report states, between March and Nov. 2017, the sheriff’s office released 87 inmates to ICE officers. During that span, ICE placed 67 holds on SLO County inmates. Additionally, the sheriff’s office was faxing ICE a foreign-born inmate report twice daily. Since Nov. 2017, the sheriff’s office has not turned over any inmates to ICE, nor faxed the federal immigration agency information on inmates. Meanwhile, ICE has not placed any holds on SLO County inmates, nor has the agency had any access to inmates while they were in local custody, according to Parkinson’s report. 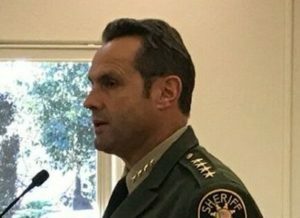 Of the 87 SLO County inmates turned over to ICE between March and Nov. 2017, 80 were of Mexican origin. Eighty-one of the inmates were male, while six were females. Seventy-three of the 87 inmates released to ICE were between the ages of 18 and 43. Although the sheriff’s office has effectively cut off communication with ICE, it has opted to place inmate release dates on its website, a measure pro-immigration activists oppose. While inmate release dates are listed on the website, nationality is not. That’s not nearly enough. I would increase the budget of ICE 100 fold. How ridiculous California law makers are to allow a law that disallows citizens of the United States from cooperating with United States Law enforcement? Could it be that the Russians control this State’s leadership as well as the continued anti Trump folly? I see serious finger pointing back at them, not the index finger. I thought SB54 was overturned a few months ago. And the crime rate in the county is on the rise,hmmmmmmm Thanks Sanctuary Parkinson. You’re in this country illegally and obviously a criminal since you’ve been incarcerated, you’re out of here! The unhinged left’s insatiable appetite to court illegals is undoubtedly going to be the death of this state and country if not stopped. Dreamers my a$$! They’re TAKERS and sucking the tax payers wallets dry.